This is an extraordinary book. Now I’ve finished reading The Owl Service it’s made me want to go back to Wales. 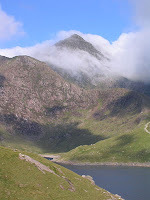 I’ll begin this post with a photo taken from Wikimedia of Yr Wydffa (Snowdon) showing the beauty of Wales. I read about the book on the Slaves of Galconda blog and remembered how much I had enjoyed Alan Garner’s book The Weirdstone of Brisingamen, about the wizard watching over the 140 enchanted knights sleeping in the caves at Alderley Edge (another beautiful place in Cheshire). The Slaves‘ reviews made me eager to read The Owl Service and luckily the next time I visited the library there was a copy on the shelves in the children’s section. The Owl Service is not just a children’s book – it’s for anyone who likes a good story with a mixture of mystery, adventure and history. The setting is very important – it is in Wales, that beautiful Land of My Fathers (well, in my case my mother). It’s always a mysterious, magical place, and although the sun does shine it is usually shrouded in cloud and pouring rain whenever I visit. The basis of the story is the Welsh legend from The Mabinogion about Lleu and his wife Blodeuwedd who was made for him out of flowers. It’s a tragic story because Blodeuwedd and her lover Gronw murdered Lleu, who was then brought back to life by magic. Lleu then killed Gronw by throwing a spear, which went right through the stone behind which Gronw was hiding; Blodeuwedd was then turned into an owl. The three people forced together, unable to get away from each other are Alison, her stepbrother Roger and Gwyn. They are all living in Wales in Alison’s house, which she inherited from her father, together with Clive, Roger’s father, Margaret, Alison’s mother and Nancy, Gwyn’s mother. Another important character is Huw Halfbacon, who lives in one of the stable rooms at the house. You are plunged into the mystery right at the beginning of the book, when Alison hears something scratching in the ceiling above her bedroom. When they find a dinner service in the loft this sets in motion a chain of events as the legend comes to life. Then a life-size painting of a beautiful woman is discovered or rather makes its presence known in the billiard room, once the old dairy. Who painted it, who painted the design on the dinner service, why were they hidden and why have they been revived? As the tension builds around the three central characters the tragic story of Blodeuwedd is being re-enacted. Will it have the same tragic ending? Nancy too has her prejudices and wants Gwyn to speak in English: ‘You know I won’t have you speaking Welsh. I’ve not struggled all these years in Aber to have you talk like a labourer. I could have stayed in the valley if I’d wanted that.’ Gwyn has bought an elocution course to help with his pronunciation and when Roger finds out he mocks him. I didn’t like Roger much and Alison irritated me a bit with her docile acceptance of her mother’s ban on her contact with Gwyn. We never actually meet her mother, but I didn’t take to her either – she sounds such a snob. Through the flowers he could see a jet trail moving across the sky, but the only sounds were the river and a farmer calling sheep somewhere up the valley. This story sounds so intriguing and I’ve never anything about Wales. Beautiful picture and lovely words. I’ll have to do some research.Love your new picture by the way, Margaret! Kay, thank you. I thought it was about time I showed a an up-to-date photo! This was taken at my nephew’s wedding last September.I think I must write more about Wales – i’s a beautiful country. This sounds so good-I loved your review. 🙂 When my family lived in England when I was younger (I’m an American), we got visit Wales twice, and I loved it. Terrifying roads, however. I struggled with the book, but I think that if I’d known more about Wales and about the legend Garner is working with I would have enjoyed it more. It certainly does make me want to go to Wales! I’m so glad you enjoyed it as it was my choice for the Slaves. Garner, himself, is a very interesting man and I think it’s essential to read his work in the light of the very intense feeling he has for both setting and the language patterns that belong to an area. Eva, I know what you mean about the roads!Dorothy, I’m sorry you struggled. I could understand the Welshness of it, so that helpedTable Talk, I could hear the Welshness in the dialogue – he did capture it well. I had never really realized that Wales was so sort of mystical (not sure that’s exactly the word I am looking for). I think I’d like to visit there very much. I liked the book, but it was a little hard going for me as well (mostly for the cultural/language differences and the myth that I was not familiar with). I’d like to read it again some time. I just came across your blog and find it refreshing and stimulating at the same time. I have loved the Owl Service for many years for its magic and its ambiguous hovering between the world in the present and other more mysterious times. (Reminds me of my own ambiguous adolescence…) Coincidentally I posted something on my site this morning about owls and mentioned Alan Garner’s very special book. Have you read his RED SHIFT? Different but I think even mor Brilliant! I will drop by again.